European nations are scrambling to save the landmark nuclear agreement with Iran, one day after President Trump announced he would pull the United States out of the deal and reimpose sanctions on Iran. The 2015 agreement was worked out by the United States, five other world powers and Iran. 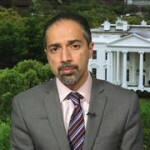 Trita Parsi, head of the National Iranian American Council, says he was targeted by an Israeli private intelligence agency over his support for the Iran nuclear deal. The agency, Black Cube, was hired to orchestrate a “dirty ops” campaign against members of the Obama administration who negotiated the nuclear agreement. The Guardian reports Trump’s aides hired Black Cube; The New York Times says it’s not yet clear who hired the intelligence firm. Among those Black Cube was hired to investigate and discredit were Obama’s top national security aide Benjamin Rhodes and Vice President Joe Biden’s national security adviser Colin Kahl. Black Cube is made up of former officials from the Mossad and other Israeli agencies. It is the same firm hired by disgraced Hollywood producer Harvey Weinstein to stop publication of articles that exposed him as a sexual predator. President Trump announced Tuesday he is pulling the United States out of the landmark 2015 Iran nuclear deal, brokered by his predecessor, President Obama. That same day, Trump’s new Secretary of State Mike Pompeo flew to North Korea to finalize plans for President Trump and North Korean leader Kim Jong-un to hold a landmark face-to-face meeting. Voters in West Virginia, Ohio, Indiana and North Carolina headed to the polls Tuesday to decide a number of key primaries. In West Virginia, the state’s Republican Attorney General Patrick Morrisey won a closely watched U.S. Senate primary, defeating U.S. Rep. Evan Jenkins and former coal baron Don Blankenship. Blankenship had served a year in prison after 29 miners died in the 2010 Upper Big Branch Mine disaster. He faced intense criticism after releasing an ad attacking Senate Majority Leader Mitch McConnell and his “China family.” Patrick Morrisey will now face the conservative Democratic Sen. Joe Manchin in November. In Ohio, Richard Cordray defeated former Congressmember Dennis Kucinich in the state’s Democratic primary for governor. Cordray served as the first director of the Consumer Financial Protection Bureau. He will now face Mike DeWine in November to determine who will replace outgoing Ohio Governor John Kasich. In Indiana, Vice President Mike Pence’s brother Greg Pence won the Republican primary for a congressional seat in eastern Indiana. Female candidates were also big winners on Tuesday. According to Politico, there were 20 open Democratic House primaries with women on the ballot Tuesday, and voters selected a female nominee in 17 of them. In Ohio, Rachel Crooks, one of at least 19 women who have accused President Trump of sexual harassment and assault, won an uncontested primary for a seat in the state’s House of Representatives.